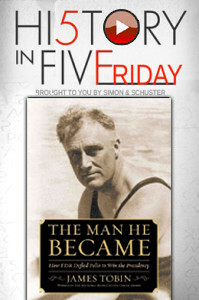 January 8, 2016 – Today, James Tobin — winner of the National Book Critics Circle Award in biography — shares one of the greatest stories of defiance and overcoming infirmity in: The Man He Became: How FDR Defied Polio to Win the Presidency . When polio robbed Franklin Delano Roosevelt of his legs at age 39, the conventional wisdom agreed that his political career was over. Certainly nobody thought he’d rise to the office of his distant cousin, Eleanor’s uncle Theodore Roosevelt. But Roosevelt kept trying treatments, methods and exercises to cope with his disability — a method of never giving up and continuing to try that helped him confront the Great Depression, and the Second World War. It’s the perfect way to kick off your modern weekend… with people from the past.